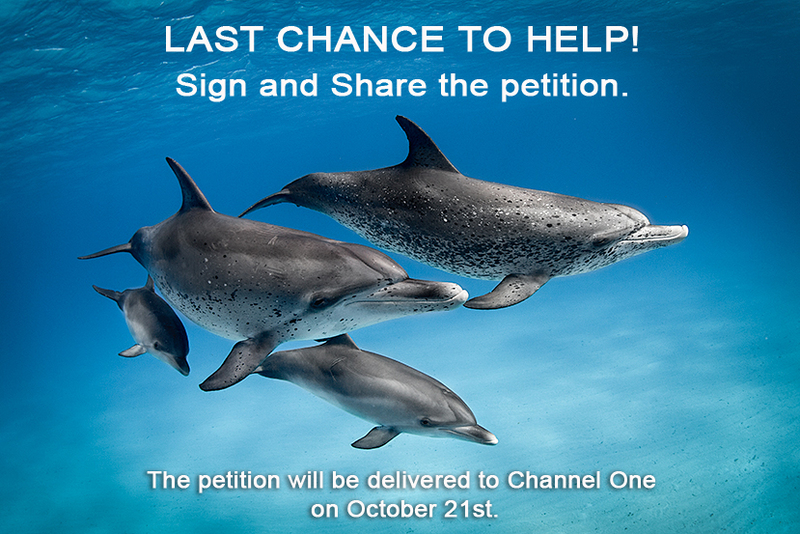 Stop Russian TV-show Petition Delivery — Общественное движение "Спасаем дельфинов"
Petition against Russian TV-show with dolphins became one of the most successful petitions in Russia ever. Many Russian people stand against the show, but Channel one ignored people’s opinion. Two days ago Russian Newspaper “Komsomolskaya Pravda” published the article that states that there will be only four episodes of TV-show “Together with dolphins”, three of which were aired already. We don’t know if it was planned to have such a short show or if it has something to do with our petition, but we do know that all our hard work brought a big change. Many Russian people became aware of the problem behind the dolphin smile. Such a great response from Russian people gives us the strength to continue this fight. There is a hope! Together we can change the world! Since there is only one episode of TV-show left petition will be delivered to Channel One office in Moscow On October 21st. МИНИ — МОНИТОРЫ ВЕРНУЛИСЬ В БУХТУ ТАЙЦЗИ.